(Intersociety & SBCHROs, Onitsha Nigeria: 22nd January 2017)-The leaderships of Int’l Society for Civil Liberties and the Rule of Law (Intersociety) and the Southeast Based Coalition of Human Rights Organizations (SBCHROs) are deeply concerned, alarmed and shocked over the wilful and premeditated killing of no fewer than twenty (20) unarmed and defenceless Nigerian citizens and terminally injuring of scores of others at the Port Harcourt (Igweocha) venue of Donald J. Trump Solidarity Rally on 20th January 2017. Over seventy (70) other citizens that attended the rally were arrested and are still being detained by soldiers and police, etc, in various detention facilities in Rivers State and possibly outside the State. The regime atrocious deaths and associated terminal injuries were carried out and perpetrated by the Nigerian Army led by its Chief, Lt Gen Tukur Yusuf Buratai; among other security forces. The operation, circumstantially, was presidentially ordered by the Commander-In-Chief of the Nigerian Armed Forces, President Muhammadu Buhari. The shootings and killings reportedly started at various sub-scenes of the solidarity rally the moment the Nigerian Army stormed the places to join other security forces on the ground and opened fire at unarmed and defenceless citizens with live bullets shot at them at close range. Some dead bodies of the Port Harcourt shootings and killings were taken away by the Nigerian Army, while others were rescued and deposited in some mortuaries located in across Rivers State. In similar shootings and killings in Onitsha and Aba in August and December 2015 as well as in January, February and May 2016; they also started after the arrival of the soldiers of the Nigerian Army. By law and circumstances, the shootings and killings are totally and inexcusably wilful and premeditated; particularly on account of existing secret or unofficial presidential death code against unarmed and defenceless Pro Biafra Campaigners and other citizens of Southeast and South-south Nigeria led by Igbo-Nigerians. The anti Igbo presidential death code is circumstantially evidential; likewise associated criminal stigmatization. Further attestation to the wilful and premeditated shootings and killings is the widely publicized written notification for the rally sent by the lead-organizer of the rally, the IPOB World-Wide to relevant security agencies in Nigeria including the Army, Police and SSS and leading diplomatic missions and social advocacy groups within and outside Nigeria. The shootings and killings have also exposed the Nigerian Army and other security agencies’ bare-faced lies and indefensible excuses made against the Pro Biafra Campaigners particularly the IPOB since 2015 to the effect that “Pro Biafra Campaigners are shot and killed during their protests because they are armed and violent”. The Igweocha shootings and killings have completely exposed these bare-faced lies and vindicated IPOB led Pro Biafra Campaigners as unarmed and nonviolent or pacifist self determination campaigners. Gory images emerging from the Igweocha (Port Harcourt) shootings and killings have also exposed the Nigerian Army, Police and SSS; in the area of criminal use of force; where unarmed and defenceless citizens who gathered for the rally were targeted and shot with automatic weapons at close range; directed at terminal parts of their bodies such as chest, waist, lung, heart, forehead, neck, reproductive and stomach regions of their bodies. The Rivers Police Command even has the audacity and shamelessness to tell reporters that “non person died in the rally”. In all these, President Muhammadu Buhari has again failed woefully in his constitutional duty to protect the citizens’ constitutional rights to life, personal liberty and dignity of human person as well as freedom of association, expression, movement and constitutional assemblies. The Buhari Administration has also failed woefully to observe and uphold Nigeria’s regional and international rights obligations under the AU and the UN Systems. Apart from grave ethnic bias and hatred which the shootings and killings further exposed; they also gravely or dangerously rubbished Nigeria as an international murderous country. It is also very important to observe that Nigeria as a current Member-State of the African Union and the United Nations under the current international diplomacy and relations; is speedily becoming a Rogue State under the Buhari Administration. Diplomatically and internationally, there have been several pro Buhari and anti Buhari Street protests and matches in strategic international capitals and cities; yet no single soul was shot and killed or terminally maimed with live bullets. Several street matches and protests have been organized and are still being organized by mass movements involving millions of citizens of various regional and international ethnic nationalities in several cities of the world for self governance, statehood or socio-political and economic self determination; yet heavens have not fallen and the host political territories have never unleashed their armies and other coercive agencies on them with brute alacrity. But in Buhari’s democratic Nigeria, over 270 killings and 350 terminal injuries have been recorded in seventeen months or 510 days or between August 2015 and January 2017. 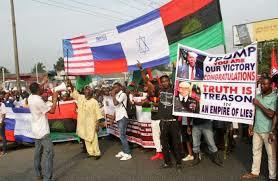 Diplomatic consequences of the pro Trump solidarity shootings and killings wilfully carried out and perpetrated by the Buhari Administration may most likely overweigh Nigeria’s current Presidency particularly as it concerns Nigeria’s relationship with the new Donald Trump Administration in Washington. The killings are the height of diplomatic blunder and miscalculation. Nigeria is doomed irreparably if it attracts to itself international isolationism from the world’s first among the equals and the equals themselves. The Buhari Administration appears deadly decayed diplomatically and internationally that it has defiantly and dangerously remained locally and diplomatically incorrigible and suicidal. The Administration ought to have learned a lot of lessons from its gross diplomatic bias and sidedness in the just concluded failed Hillary Clinton and former President Obama’ election campaigns; but we are deeply disappointed that the reverse is grossly the case till date. Granted that there exists diplomatic lobbying, but how can the Buhari Administration explain to the Trump Administration that it killed not less than 20 unarmed and defenceless citizens, terminally injured dozens of others and detained over seventy (70) simply because they non-violently and harmlessly gathered to show solidarity with Mr Donald J. Trump on his historic swearing in as the 45th President of the United States on the same date of the shootings and killings? Will the Trump Administration abandon the Statue of Liberty and swallow President Buhari’s expected indefensible excuses? Is Nigeria no longer a key Member-State of the United Nations? What about the Principles and Purposes of the United Nations and the Fundamental Rules of the United Nations or Opino Juris including the Ten Basic Standards of the International Law, Use of Force and the Hallowed Right to Freedom of Expression? Is Buhari’s democratic Nigeria now an island of itself? Can the Ghanaian security forces, for instance, order for mass murder of Nigerians in Ghana on account of their jubilations or rallies over the Super Eagle’s defeat of the Black Stars in a football match? We shall not be surprised to read in coming days or weeks in Nigeria’s print, visual, audio visual and web media; particularly those with strong ethno-religious bias and news censorship, a scripted or diplomatically coerced statement from the authorities of relevant diplomatic missions in Nigeria or the Government of Nigeria with indefensible excuses bordering on the reason for diplomatic indifference as it concerns the shootings and killings or dissipation of diplomatic or verbal energy as in why President Muhammadu Buhari’s name was omitted from the list of the international dignitaries invited for Trump inauguration at the White House; thereby ignoring diplomatic and moral abominations trailing the Igweocha pro Trump rally shootings and killings. As we and other Nigerians and members of the international community await the completion of the ongoing statistical compilation and computation of the images and bio-data of those killed and maimed at the Igweocha Pro Trump Solidarity Rally of 20th January 2017; we again console with the families that lost their loved ones and bread winners as well as the leadership of IPOB World-Wide and urge them to take heart and see the death of their slain comrades as a price for liberty of their race to be saved and rescued from age-long physical or structural violence in a bleeding Federal Republic of Nigeria. We also urge them to remain unprovoked, pacifist and nonviolent at all times. It is extremely important to inform them that the Buhari Administration and its leading regime atrocities perpetrators including President Buhari himself, Lt Gen Tukur Buratai, former Inspector Gen of Police, Solomon Arase, current IGP, Ibrahim Kpotum Idris, SSS boss, Lawal Daura and their culpable sub commanders as well as the present Governments of Abia and Anambra States which culpably aided and abetted the 9th February and 30th May 2016 military massacres in Onitsha and Aba ; are doing everything immoral or crooked to escape from the long arm of the law, locally and internationally, at the appointed time and dates. One of the escape routes desperately and deadly being exploited by the named perpetrators is to provoke the families of the slain and the IPOB World-Wide to collectively resort to reprisal radicalization including armed rebellion or insurgency so as to find enough grounds to escape retribution and eternal moral damnation itching speedily at the doorsteps. These, the members of the slain and terminally injured families and the IPOB World-Wide, must never allow. The regime atrocities perpetrators who have chosen to remain adamant and repeat-perpetrators; must at all times be guided to the path of retribution and eternal moral damnation without recourse to shortcuts, reprisal radicalization and jungle justice. The United States Embassy in Nigeria is also called upon to rise in condemnation of the heartless killing and maiming of these unarmed and defenceless Nigerian citizens who gathered to join the United States in inaugurating her 45th President and renewing her total allegiance to the American People, the Hallowed Statue of Liberty and the rest of the World in her moral and diplomatic capacities as the Police of Global Security, Peace and Human Rights!